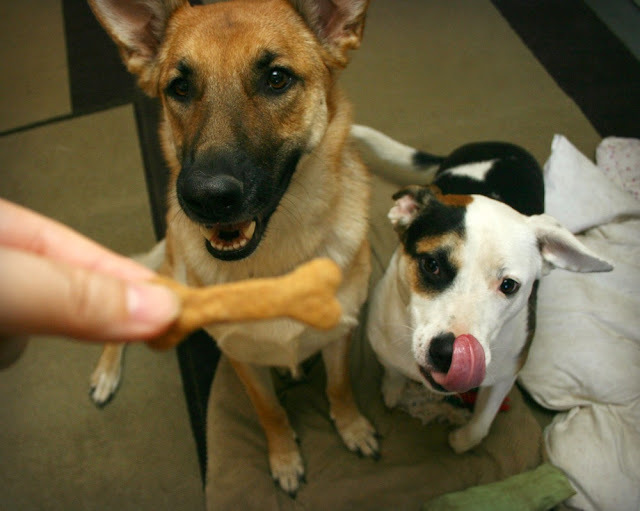 I'm surprised dog treats didn't make an appearance on our blog sooner. 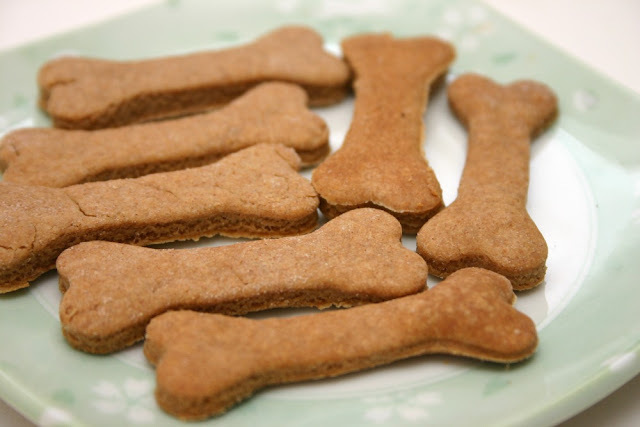 After all, I have two dogs and GG has one but I've always thought that making dog biscuits were more involving. Boy was I wrong! They couldn't be easier. 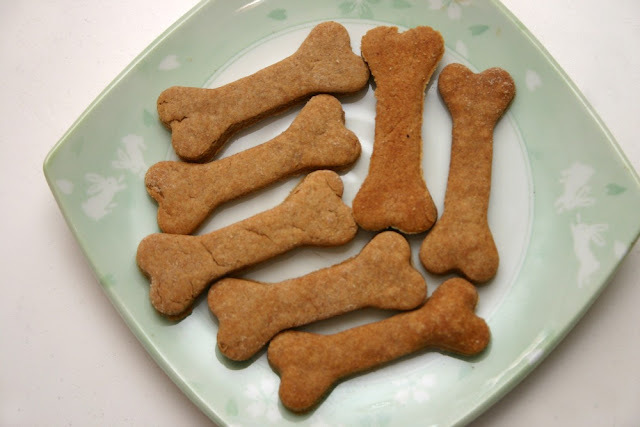 After reading up on countless recipes for dog biscuits (some of which called for chicken livers, brewers yeast and some other ingredients that I didn't have on hand), I finally settled on a simple one that called for just a few ingredients and I had all of them in my pantry. I had purchased a dog bone cookie cutter off eBay last month and was surprised at how tiny it was when it arrived. I guess I hadn't paid enough attention to its actual size in the listing but for $2, I really shouldn't be complaining. :) Anyway, on to the recipe! 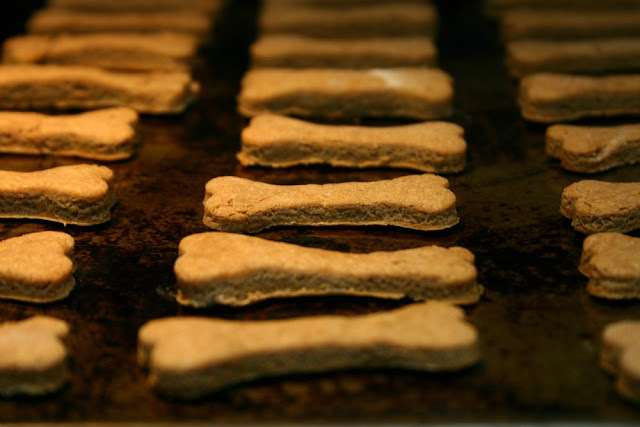 Makes about 60 small bone shaped biscuits. Stir the flour and baking powder together in a bowl and set aside. In a large mixing bowl, combine the peanut butter and broth; mix well on medium speed. Add the dry ingredients a little at a time and continue to mix until well incorporated. The dough should hold together. If you find that it's too crumbly, add more liquid (either broth or water) one teaspoon at a time until you get the right consistency. Turn the dough out onto a floured surface and knead a few times. Roll the dough into 1/4" thickness then cut out into your shape of choice. You could also roll them into 1" balls and flatten them with a fork. Bake on a cookie sheet for about 15 to 20 minutes or until they're golden brown. Transfer to a wire rack and let cool before storing or feeding to the eager doggies. They should be stalking you in the kitchen right about now. You can also store the dough in the freezer and bake them in batches, as needed. 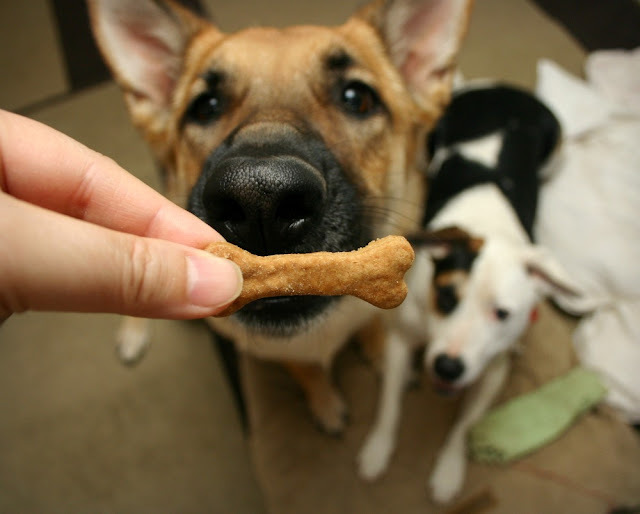 These biscuits are nose-lickin' good! 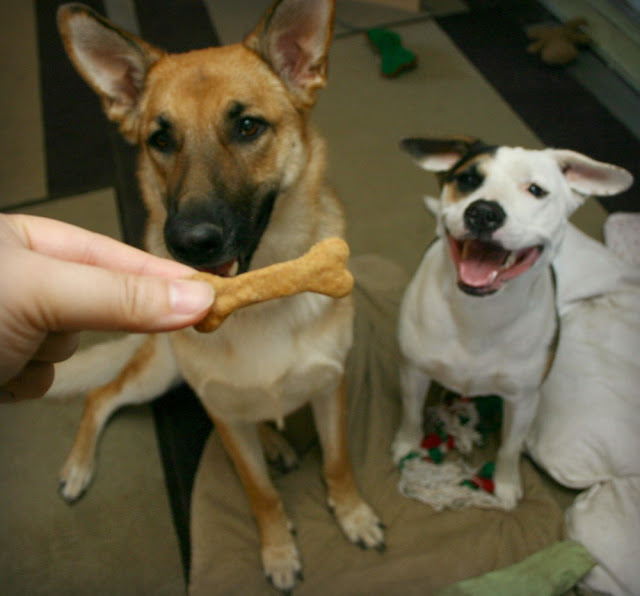 And they bring happy smiles to some canine faces!